The tools that I use range from various materials. The picture above is of my exact tools. Of course I have more but I wanted to show you want I actually use day to day. 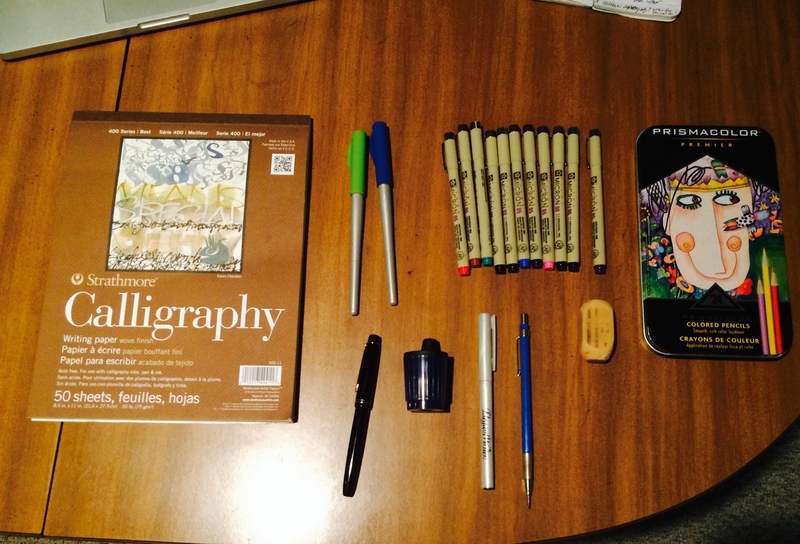 The tools that I use may not work for your approach and or type of calligraphy. For the calligraphy pad I use is a Strathmore calligraphy pad. The paper is woven and 20lb weight and 8.5×11. Before I was using computer paper. I will admit I improved a lot from using computer paper and etc. So starting out I would not recommend starting out with this pad right from the beginning. But really it depends on whether you want to spend the money or not. The reason I say that because you don’t want to buy something of high quality when you do not have a good grasp on how to use the tools. The pens I use are pilot parallel pens. Sizes of my parallel pens are 6.0 and 3.8 mm. Parallel pens are some of the best calligraphy pens I have used. The only thing is the fibers that get caught in the nib of the pen. Cleaning them is very very simple. Of course microns where would we be without them. I purchased the various colors to have a variety. A great thing is how the pens do not bleed. Also they do not interfere with the pilot ink. Prismacolor color pencils are great for experimentation. These are good for taking a trip back to childhood. One thing I enjoy about using these are the possibilities. Pilot 78g is the first fountain pen that I ever bought that was of good quality. The pen is of great quality and also the ink flows very smoothly. If you decide to purchase this make sure to get some extra cartridges. The Staedtler lead holder and sharpener are two things that you should get together. Because sharpening the lead on the lead holder with the built in sharpener (the metal top) is pretty terrible if you want to get a good sharp point. Another thing is the lead dust that collects in the top. Speedball calligraphy marker is an ok calligraphy marker. The nib is felt and it gets worn down pretty quickly. 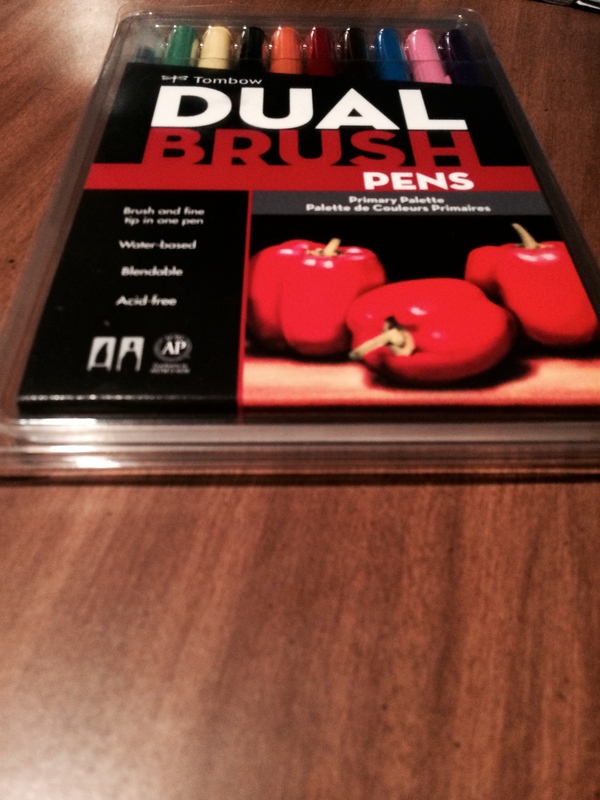 If you want to have a calligraphy marker that is cheap and good for practice I would recommend giving this a try. Tombow markers are hands down some of my favorite brush pens. The quality of these are very good. But the nibs get worn down after a good amount of use. The brush tip to be exact is what gets worn down quickly. Storing these I keep them in the container you see here. Because before I stored them with one point down and it dried up. Some more things I enjoy about Tombows is how the ink flows so smoothly. Also getting used to them just requires getting comfortable with it in your hand and then developing your own flow to your letters. By flow I mean size, shapes and etc. Well there you have it I hope this will help you in getting started with your calligraphy journey and or what you should add to your current tools.